The area in Loutra Ypati is ideal for walking and cycling. So take the bike with you, or, ask us for availability and we are always willing to inform you about routes, depending on your strengths. A visit to Karpenissi (about one hour, 70 km) is something we must do. Beautiful town, graphic villages, easy access, spectacular nature, fantastic ski resort, accommodation of high standard, fantastic food. 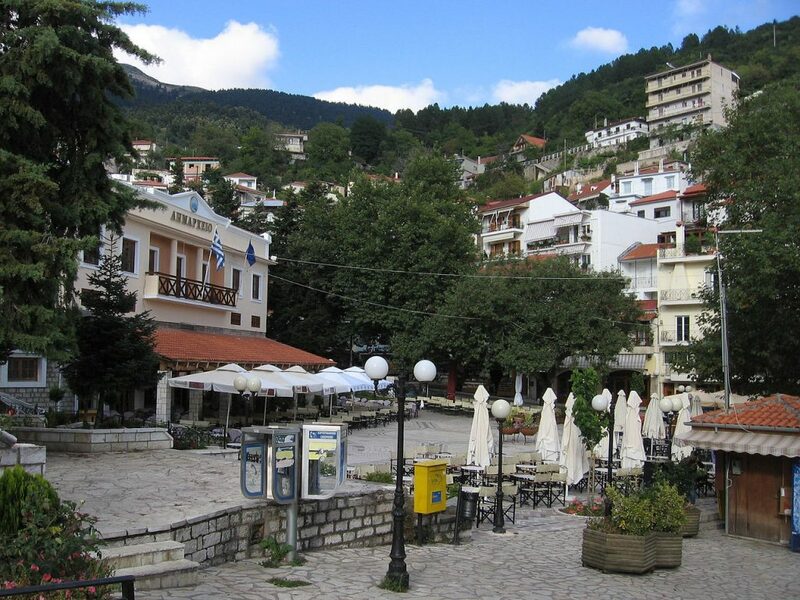 Karpenisi is a city rich in history, resting lazily in the lap of Velouchi , the ancient Tymfristos at an altitude of 960 meters, lush fir, well protected from the strong winds that whipped the top. Great personalities of the Greek history came from the wider region of Karpenisi, such as the great palikar Katsantonis, synonym of bravery and selflessness, the member of Society Of Friends (Filiki Etairia) and a fighter of 1821 Thanassis Karpenisiotis, the author of the diachronic masterpiece “The mountains”, the academician and politician Constantine Tsatsos, the politician Pavlos Mpakogiannis and many others. Many great and brave men chose this area to set up their nests, like Karaiskakis, Mpotsaris and Velouxiotis. For winter sports enthusiasts, there is the ski resort of Karpenisi, one of the largest and most impressive of Greece. It’s not just a restaurant that you can go for a meal, but it often performs concerts, theatrical performances and several cultural events. Only 1 kilometer from the hotel. Gorgopotamos is one of the most beautiful villages of the prefecture of Fthiotida and is located about 16 km southeast of Loutra. The village is built at the foot of Mount Iti and in height of 35m, surrounded by greenery, natural beauty and crystal clear waters of the river Gorgopotamos. The name of the village is due to the river “Gorgopotamos” that flows near the village and ends at Sperchios river. 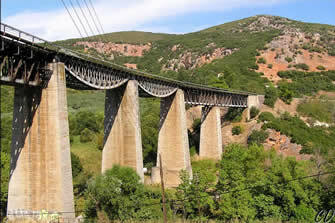 Above the village is the historic bridge of Gorgopotamos, that connects the two sides of Iti and on which crosses the railway line Athens – Thessaloniki. One of the most glorious pages of the modern history of Greece was written in this bridge. On the night of November 25, 1942, resistance groups in collaboration with an English echelon, under the command of Colonel Mayer, blew up the bridge, causing long delays in crossing the Germans, who pressed the allies in Africa. The Greek government in 1982 established the Blow up of the Gorgopotamos Bridge as an official celebration of the Greek National Resistance and as date of celebration, the date of blowing up the bridge. Lamia is the capital of prefecture of Fthiotida and is located 209 km north from Athens and 19 km far from Loutra Ypatis. Lamia also constitutes the capital of the Region of Central Greece,an important transport hub, being located on the highway Athens-Thessaloniki, the commercial and industrial center of the prefecture, and furthermore is the center of a fertile agricultural and livestock area. It is an old picturesque town surrounded by two pine-covered hills. 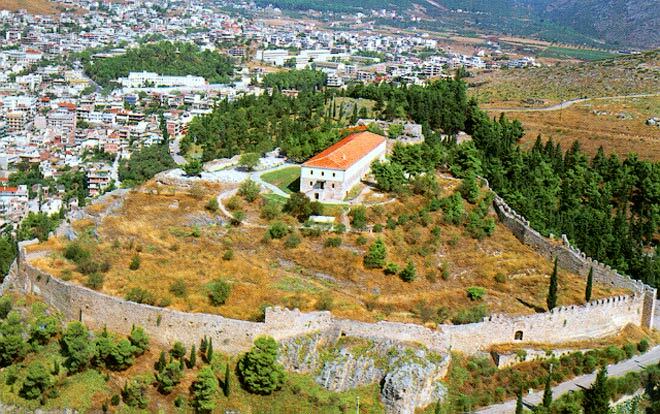 On one hill dominates the medieval castle of Lamia, which is built on the ruins of the ancient wall of polygonal blocks, and the other is the church of St. Lukas, built in the 18th century. Places of Interest If you visit the city of Lamia, you should visit the Cathedral of Evaggelistria (Annunciation) in the Freedom Square (the central Square of Lamia), the statue of Athanasios Diakos (a revolutionary hero of 1821 against the Turks) in the homonym square, the cenotaph of the hero in the People’s Square, the post-Byzantine church of Pangaea on the south side of the castle, the Public Library with approximately 7,500 volumes, and neoclassical buildings, that offering a unique feature in the city. Lamia also has a museum, a folklore museum and the Municipal Gallery with valuable exhibits. Our area is full of Canyons, so if you like this sport have a look at the canyons that are near us. At the pages below you will find all the information you want.